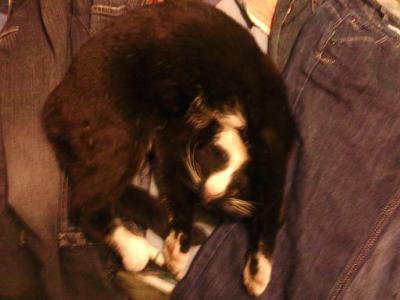 Hey, It has been so long since I have written about Turkey the tuxedo turner :) She has changed so much! She is much bigger now, Much stranger, And much stronger. She gallops like a horse, Still catches my eye around the corner, I love her soo much! I have written about her a couple of times on this site; But this moment is something that I would REALLY like to share. From baby to full grown lady..
TURKEY IS PREGNANT! And I could not be happier, Little tuxedo babies running around will be wonderful! The kittens are due in about 2 - 3 weeks. Finding homes for them will not be easy; Or perhaps if they look as good as Turkey then it will not be a problem. One of my absolute favorite things about turkey is that she loves to sleep in the crockpot on the counter. When my family walks by we all say "What's for dinner??" and you can guess our reply; "Turkey is for dinner!" Our family loves her very much, She has been with us all this time and has become quite a member of the family. I still have a video from the very first day that she came home. She was so kitty bitty! Now look at her, Almost a year old. Just 4 more days until her birthday! you have a good eye haha..
Wow! Now that is one relaxed kitty! Is she in a basket of laundry or what? Congrats on the pending additions -- I'll be eager to see a picture of mama and the babies when they arrive. Thank you so much for your comment, That is very sweet of you! Congratulations on this wonderful news. Wow, I can't believe Turkey is all grown up and will soon be a mother. I know it will be hard to let the kittens go but I hope each of them finds a loving home, just as Turkey did. By the way, she looks so relaxed on that picture. So cute too.